Two Zombolette stories are now totally done! I have plans for a few mini one-page gags to squish between them, then I have to paint the cover, then I’ll have another floppy out! I’m pretty much a professional web developer now. Only, I’m one who just uses pre-programmed themes and doesn’t know how to do anything. I’ve done SO MUCH editing of the inked pages in the most recent story… lots of cutting and pasting, rearranging, trying to get it just right. 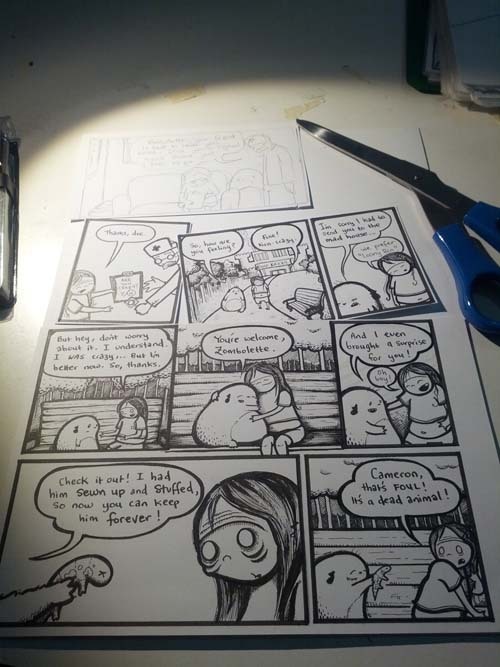 I want to go back and re-ink some of the panels from the other story I finished (the yoga one), but my inking has come such a long way since then I think it would really stand out! For the page below, I wanted Zombolette’s world to be more clean and crisp to reflect the plot. I normally draw very scraggly environments, but this was fun.